As a child, you likely wanted to be a veterinarian: a career, you assumed, filled with playing with animals. But if you really understood what they did, if you understood how often they were scratched, bitten, peed on, how often owners yelled at them, how often they had to euthanize someone’s family member, you may have had second thoughts. So those who do become veterinarians, at their core, at the compact soil even beneath their foundations, are good people. Or at least the ones I interacted with on Sunday were. Because I’m a writer always seeking new experiences (and a fool for pretty eyes), I agreed to go with a friend to the Paw Team’s Portland clinic—an animal hospital for the homeless. Once a month, they offer comprehensive veterinary services to the impoverished for free. I really didn’t know what to expect when I woke at 6:00am, mainly because at 6:00am, I don’t even expect to be awake. But after a bowl of cereal sat happily in my belly, I picked up my friend and we were off. supreme competence at everything—I agreed to be tossed headfirst into the den of animals. I worked primarily as a “runner.” I guided clients from the lobby to the clinical area—a large room with foldout tables divided into different stations—where an owner’s pet could receive vaccinations, doctoral assessment, grooming, flea treatment, and a number of other services. All of which, I will remind again, was completely free to the client. While there, I spoke with owners, waited with them as stations opened up, helped the vet if she needed assistance—my greatest asset: not getting in the way. 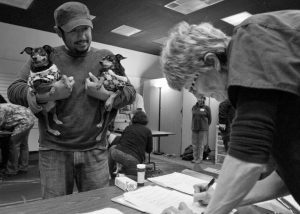 It was a frenzy in there, three to five vets working to get through a line that began forming at 5:00am when the clinic didn’t open until 8:00am. Yet even with all the mayhem, the vets never stopped smiling, never stopped caring. They treated each client as if he or she was the first of the day and each animal as if it were the vet’s own. All that pure goodness singed my narcissistic, selfish skin at first, but by the time my flesh stopped sizzling, I realized that I had found a new role model for self-improvement. From the other volunteers to the doctors themselves, they unflinchingly cared for the animals and people most of society try to forget. A genuine altruism I hope to embody myself in the future. But one that will rarely be expressed in this blog. Amazing how a new experience can change one’s thinking at core level. This was a good read,and it sounds like a Character changer or, an AwHaw experience for you. One thing I would like to say or ask is, If a person has a genuine altruism experience that they desire to some day embody and (yet the change truly has already begun) choose not to share that change in their Character through this venue, some how it doesn’t seem right for your readers. Actually, I should speak just for myself and not others. You are a Man of truth and integrity. Blessed with the gift of expressing yourself through writing. Why would you not want to share that new discovery of yourself when it comes to the surfice in your writing? I could be way off on this one. I just wanted to express my thoughts and to ask you a couple of questions.